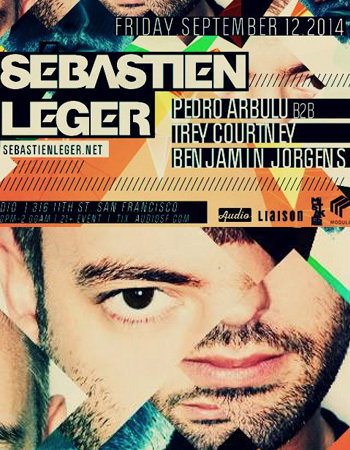 Léger has been at the top of his game for a decade now – respected by his contemporaries and idolized by those who worship at the altar of pleasure-seeking dance music. His label, Mistakes, has further strengthened his role as one of Europe’s leading proponents of contemporary underground techno. The antithesis of the showman that is fellow countryman, David Guetta, Leger mines a wholly different vein, updating the rich musical histories of Detroit and Chicago with a quiet determination and no-nonsense approach. His much lauded musical ability stems from a classical background, but formal training is but one half of the story; having served his ‘apprenticeship’ in clubs around France in his teens, drawing inspiration from heroes such as Laurent Garnier, Daft Punk, and Etienne De Crecy. Leger is thoroughly 21st century in his delivery and execution, packing a punch that has seen Mistakes become a best-seller on Beatport, and an imprint that is defining a new sound away from the soulless beats and clicks of minimal. Despite his more cerebral sound of late, he brings to proceedings a dance floor sensibility that is all about the ‘funk’, injected with a heart and soul attitude that means his music is never clinical. Performing alongside some of the world’s top electronic music artists, Moby, Max Cooper, Super Flu, Tube & Berger and Martin Buttich, Always on the melodic tip, he continues to connect to listeners with his heavily influenced sounds of House & Techno. He draws his inspiration from the growing number of electronic music listeners around the world.